I love looking for more recipes to do that go with tea. 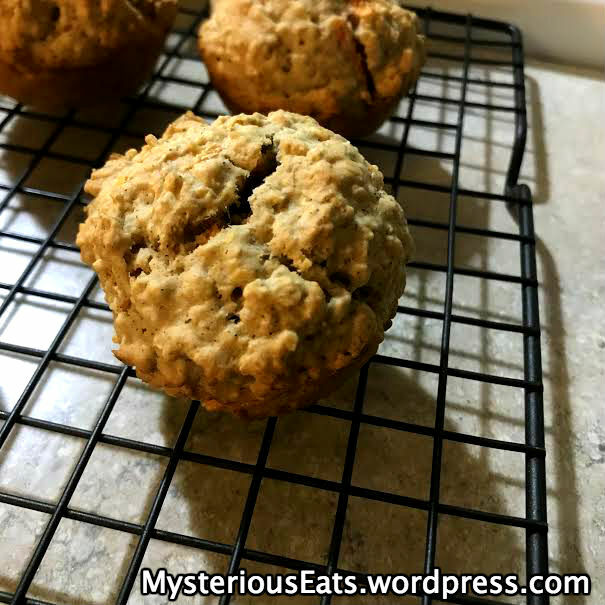 This recipe comes from my sister blog, MysteriousEats, I wanted to make it as I hate eating oatmeal-like for breakfast with milk or hot water. Ugh, so gross-So any time I find a recipe that uses up oatmeal in baking, I love to try it. But as I was making it I ran into one problem, I had started baking but then realized all my eggs were bad! I went online and found you can substitute with applesauce. Grease or spray with nonstick cooking spray a 12-cup muffin tin, set aside. Preheat the oven to 375 degrees F.
In a large mixing bowl, combine flour and oatmeal. Sprinkle the baking powder, baking soda, and cinnamon on top. Mix them thoroughly. Stir in the brown sugar. Mix until all is blended. Shred the carrots if you haven’t already done so. A fine shred is best. You want them to cook in the time it takes the muffins to bake and turn golden brown and delicious. Add the shredded carrots to your bowl and mix them thoroughly. In a separate small bowl: combine the milk, beaten egg, melted butter, and vanilla. Give it a good stir so that everything is well combined. Dump the contents of the small bowl into the larger bowl. 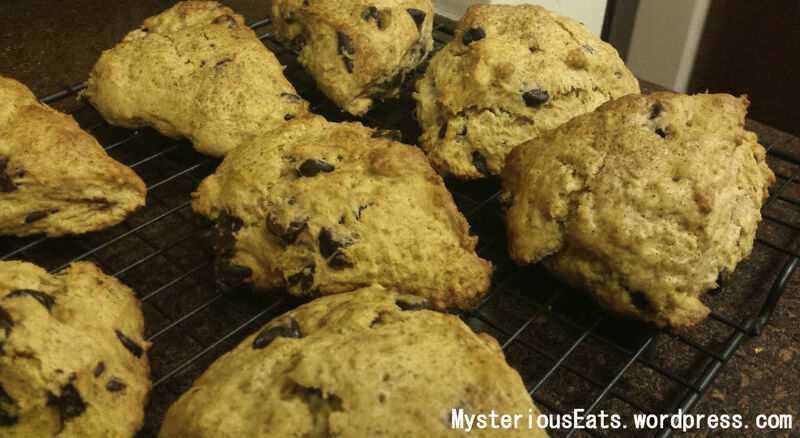 Gently stir just until the dry ingredients are moistened and no dry “pockets” remain. Fill the prepared muffin cups 3/4 full. Bake for 20-25 mins or until a toothpick inserted in the center of the muffin comes out clean. Set the muffin pan on a cold burner or a wire rack for 10 mins. After they have cooled for 10 mins, put them on a rack to cool. I loved them! So healthy and delicious! This year I have a lot to be thankful for-1) Being alive-my ex-husband was abusive and tried to kill me; 2) My 5-year restraining order and the fact that my divorce was finalized 10/24/18-thank you California! ; 3)My friends, family, and faith who have gotten me through this; 4) And this blog and all you readers! So what would Jane Austen be eating if she was celebrating the American holiday? 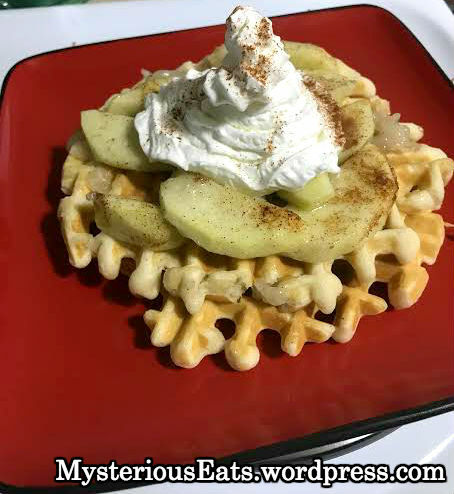 Last year I shared a recipe for apple pie, I thought this year I would share one for baked apples which make a great breakfast, side dish, or dessert. This comes from my sister blog MysteriousEats.wordpress.com. 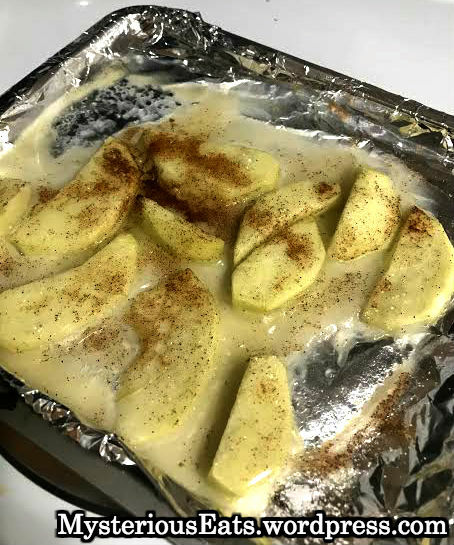 Spread the apples slices in a single layer on a baking sheet. Whisk the water and flour together, and pour over the apples and gently stir. Sprinkle with sugar and cinnamon. Cook for about 15 mins. For more Thanksgiving posts, go to Are Dean Winchester and Jane Austen Kindred Spirits? So even though it is summertime, you all know I will not give up my tea. And pinterest knows this so they send me lots of tea recipes. This one I found sounded very good, London Fog Smoothie. I love London Fog lattes, I love smoothies, why not combine the two? The picture with the ingredients was saved from a site called womansbust.com, but when I clicked on the link there was nothing about tea on it, only enlarging a woman’s breasts. This was better than the Fauxccino as I think having the cup of tea added to it better than the ice cubes. It came out a bit watery so I really thinking combining the two would work best. It didn’t come out super sweet with the Greek Yogurt and regular milk, so I added French Vanilla Creamer to sweeten it up. Regular yogurt would have been a better choice. But I know for next time. The cinnamon was very strong too, I would have done way less-just a dash. Otherwise, it was very good. And a great tea drinking method for the summertime. For more tea posts, go to Got Tea? Are Dean Winchester and Jane Austen Kindred Spirits? Did you know that Jane Austen felt the same way? I hope you all have an amazing Thanksgiving Day and enjoy yourself some pie! In a mixing bowl, mix up the shortening and flour. Add in water, a tablespoon at a time until dough is more malleable. If you add too much and it is too liquid-y, then just add a bit more flour to firm it up. When cutting up the apples, make sure to remove the hard pieces where the seed grows along with any spots or blemishes. 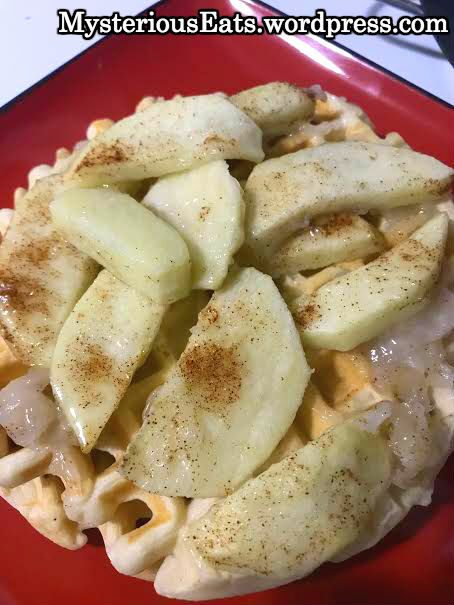 Combine the apples, with the brown and white sugar. Add the flour and cinnamon, mixing them all together. Divid the dough in half and roll into two balls. Take a cutting board and put a little flour on the surface, rubbing it. Rub flour on your rolling pin as well. Place the dough down and roll it into a large circle. Place the dough in a cake pan. Lay the apples down on the dough in the pan. Put the two tablespoons of butter on top. Place the second ball of dough down and roll it out into a large circle. Place it on top, to be the top of your pie. Cut a small incision on the top of the pie to allow steam out. Add a dash of cinnamon and sugar on top. For more on Thanksgiving, go to Is Love at the Thanksgiving Parade Really Just Pride & Prejudice? So this recipe comes from my sister blog MysteriousEats.wordpress.com. Typically I just reblog her posts onto my site, but I noticed that they don’t look the best and kind of come out weird looking. So instead I decided that I would just copy and paste her post onto my site. Here we go. Ready for scones & tea. So we were having a tea at church and I needed a scone to go with our food. I had already decided on a savory (will be posting soon), but needed a sweet scone. 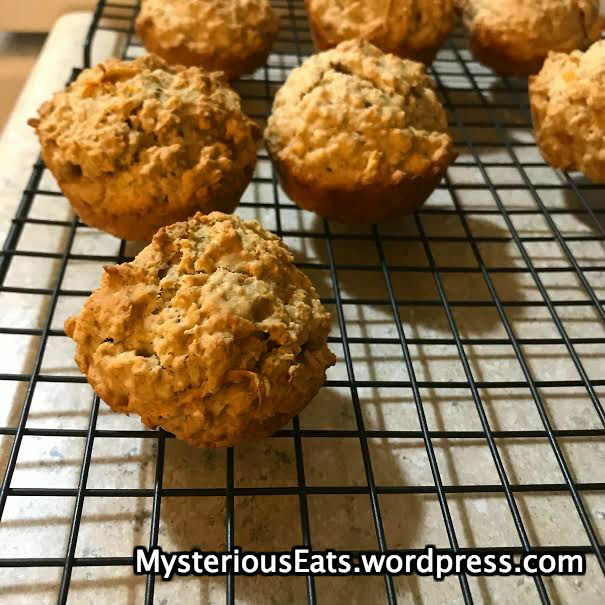 I started scouring the internet when I came upon this recipe on The King Arthur Flour website. Everything I have made from them has been fantastic so I thought I would give it a try. In a large mixing bowl; whisk the flour, sugar, baking powder, salt, and the spices (cinnamon, ginger, nutmeg, & allspice). Work in the butter until the mix is unevenly crumbly; it’s ok for some larger chunks of butter to remain unincorporated. In a separate mixing bowl, whisk together the pumpkin and eggs till smooth. Add the pumpkin/egg mixture to the dry ingredients and stir until all is moistened and holding together. Line a baking sheet with parchment; if you don’t have any use the sheet without parchment,but don’t grease it. Instead sprinkle a bit of flour on the parchment. Scrape the dough onto the floured parchment or pan and divide it in half. Round each half into a 6″ circle, about 3/4 an inch thick. Brush each circle with milk and sprinkle with cinnamon-sugar mixture. Using a knife, cut each circle into size wedges. Carefully pull the wedges away from the center to separate them just a bit, about 1/2 inch space between them. Place the scones in the freezer for 30 degrees uncovered. While the scones are chilling, preheat the oven to 425 degrees F.
Back the scones 22-25 mins or until golden brown and toothpick inserted into a center of one comes out clean. The edges should be baked through. I loved them! They were perfect! They were just so delicious everyone ate them right away and wanted more. I cannot recommend more strongly that you should definitely make them. I wasn’t really planning on including this in my Christmas countdown, but hey a post is a post so it needs a song to go with it. So I had never heard this song before until the other when I was driving to work. At first I was like what is this? Who is Dominick the donkey? But then as I listened, it quickly grew on me. So much that I actually listened to it later at home and decided to include it in our countdown. After all, donkey’s need love too. So this song is called Dominick the Donkey and was written in 1960 by Ray Allen, Sam Saltzberg and Wandra Merrell. It was recorded by Lou Monte and is about a donkey that Santa owns, used to help deliver presents to children in Italy as reindeer cannot climb the mountains.